Makan or eating is Singapore's favourite pastime. And there's plenty to partake off on Ubin! Encik Ali bin Montail's eating establishment is the first on your left as you exit Ubin Jetty. The shop has been around for more than 30 years. 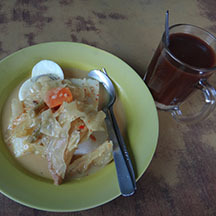 The homemade lontong is to die for (soft, unlike the plasticky hard stuff served everywhere else, with a delicious gravy). Sold only on Sundays, it quickly sells out and you will be lucky to get any after 11am. Mee rebus, mee siam and nasi lemak are also sold, all deliciously homemade as mum would make it. The shop closed following the passing of Encik Ali and his wife, but reopened in 2017! The first restaurant you see when you enter Ubin is Cheong Lian Yuen which serves seafood and has seating by the beach. 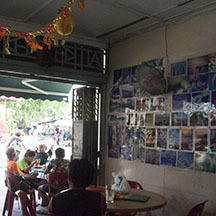 In the middle of Ubin town is a little restaurant with lots of photos of Ubin now and in the past, on its wall. Run by two sisters, it's simply called the Sisters' restaurant. They serve homestyle food and seafood with friendly service. Further along is another seafood restaurant next to the sea with a view of Ubin Jetty is run by Ah Lian, so it's simply called Ah Lian's restaurant. Shops at Ubin Town centre (near the wayang stage) also sell fresh coconuts, deserts like ice kacang, and snacks like kacang putih, curry puffs, chicken nuggets. Ubin's varied fruit orchards offers fresh fruits with the season. 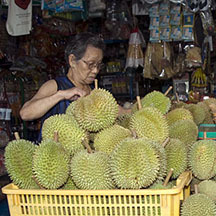 Ubin's durians are said to be among the best, better even than those from JB (Johor Baru). Ubin also offers rambutans, mangosteens, chempedak (jackfruit), local coconuts and other local specialities such as chiku. These are sold at the provision stores in the centre of Ubin Town, and when in season, often off a lorry at the entrance to Ubin Jetty, for the convenience of visitors. Drink stalls sprout up all over Ubin during the weekends to cater to daytrippers. You can get a fresh cold drink, from a can or even a coconut. Cooking outdoors? If you are camping out, please be careful about lighting open fires. These may not only endanger you and your belongings, but may also damage public property or spread to the natural vegetation. Please dispose of all litter so they do not attract unwanted visitors such as wild boar, monkeys and annoying insects. at Pak Ali's shop near Ubin Jetty. Sisters' Restaurant with historic photos. Ubin's durians are highly sought after. Endangered Ubin Lontong part I and part II on the Pulau Ubin Stories blog. Your favourite restaurant on Ubin a poll on the Pulau Ubin Stories blog.